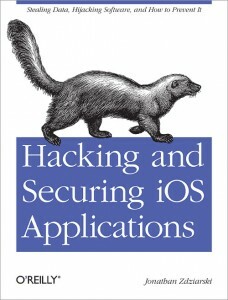 O’Reilly is presenting a free webcast by Jonathan Zdziarski on the topic of Hacking and Securing iOS Applications on May 3, 2012, at 1 PM PT. Jonathan is the author of the O’Reilly book by the same title. In this webcast, Jonathan will demonstrate a number of ways to manipulate the runtime of App Store applications using free, open source tools. You’ll see how application security is breached, how application logic is changed, and how, as a developer, to better secure your code through demonstration and discussion. We’ll be demonstrating attacks against a popular picture vault application in the App Store, how Pandora is attacked to obtain free skips, and how a virus can be written to infect applications to steal user credentials as the owner of a device is using their favorite financial applications. Don’t miss this informative presentation. Register now at O’Reilly for what looks to be a promising presentation. This entry was posted on Tuesday, May 1st, 2012 at 2:03 am	and is filed under security, software, talks. You can follow any responses to this entry through the RSS 2.0 feed. You can skip to the end and leave a response. Pinging is currently not allowed.